In the latest episode of Star Wars Rebels, our group of heroes sabotage a parade on Lothal celebrating "Empire Day", the anniversary of Emperor Palpatine ending the Clone Wars and forming the Galactic Empire. In Star Wars Episode III: Revenge of the Sith, the Empire was welcomed with, as Padme Amidala put it, thunderous applause. The Republic was a broken system and the Clone Wars were only making matters worse. To the average galactic citizen, the Empire was the exact turning point the galaxy needed, making it a galactic holiday where attendance to the celebration is mandatory by law. 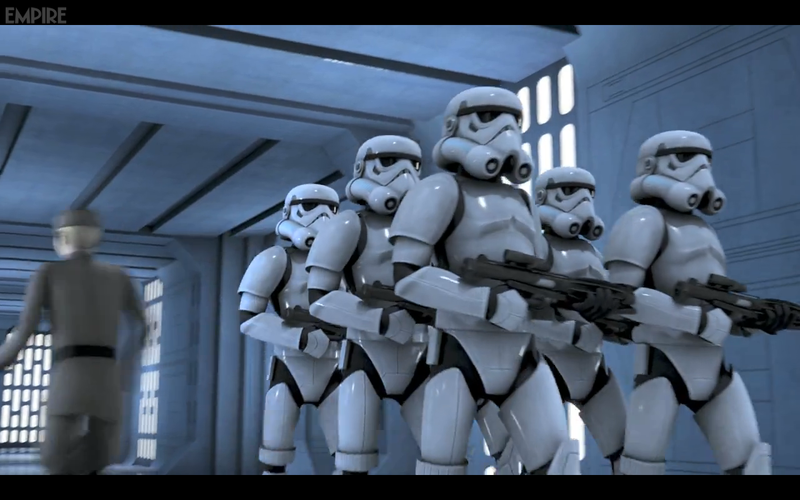 In the "Rebel Recap" video that goes in depth of the most recent episode, Executive Producer Dave Filoni informs viewers that he asked show composer Kevin Kiner to take the Imperial March we all know and turn in into a celebratory parade march. The team behind Rebels also speaks about how propaganda and Imperial media play a large role into the series. Recently posted to StarWars.com, check out the new and improved Imperial March, entitled: "Glory of the Empire".